Research has shown that students lose about 2 months of math computation skills over the summer and can fall 2 reading levels. 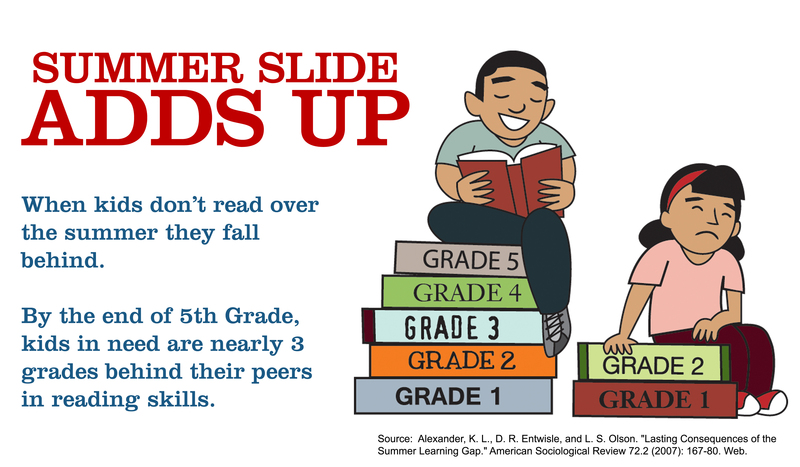 Did you know that teachers spend 4-6 weeks in the fall reteaching skills that students lose over the summer? Read EVERY day! Read non-fiction, fiction, ebooks, poetry, newspapers and read out loud! For most children, twenty minutes is an appropriate amount of time to read for a child who is an independent reader. Cook with your children. This is one of the best ways to integrate math, reading and following directions. Let your child design the menu too! Help your child put together their favorite recipes in a cookbook. Learn a new word each week! Hang it on the fridge and see who can use it the most times throughout the week. Take pictures and make a summer scrapbook. Take a field trip to a museum, zoo or local park. Keep a journal about your travels. Taking a walk or hike through nature not only keeps kids’ bodies active, it keeps their brains active too! Kids expand vocabulary as they name and describe what they see in nature. They can also build math skills and learn scientific concepts. After the hike, you can have your kids draw pictures about what they discovered or write in a journal about their adventure.